A visit to Thailand without experiencing some of the beautiful Islands and beaches is a little like coming to London and not seeing Buckingham Palace. 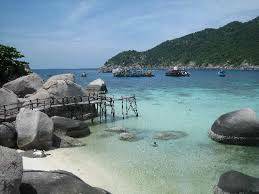 From Bangkok there are various ways to reach Koh Tao which is a good base point for Island hopping. If travelling by train be sure to book a first class lockable cabin with sink and flat bed for the over-night journey and if you're happy with eight hours of discomfort the bus is by far the cheapest way to reach the ferry port at Chumphon. The quickest way is, of course, to fly into Koh Samui with Bangkok Airways and pick up the high speed ferry which reaches Koh Tao in under two hours. 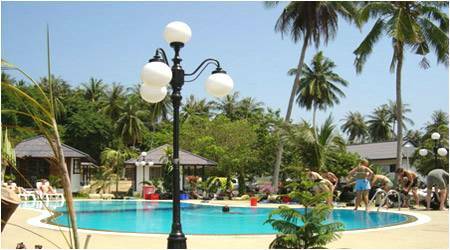 Koh Tao is well worth the journey and is one of the true treasures of Southern Thailand. The Island has miles of sandy beaches, secluded Bays and warm shallow waters. Translated as "Turtle Island" most visitors are lucky enough to see these beautiful native creatures on land or in the water. Koh Tao is a great place to snorkel but in recent years has become a centre for scuba diving. Crystal Dive Resort is award winning and comes highly recommended as it is suitable for divers of all levels. The team is enthusiastic, knowledgeable and passionate about their sport and it is impossible not to feel like you are in very safe hands. The one day "Discover Scuba Diving" course is just perfect for nervous beginners and those with limited time. It is almost guaranteed that after taking your first breath underwater you will never want to snorkel again and progress along the PADI courses. Sensi Paradise Beach Resort is located a few metres from the beach at Mae Haad Bay on the west of the Island. It is a very romantic setting popular for weddings and a favourite with honeymooners. The hotel has a number of traditionally decorated individual villas and bungalows which epitomise desert island bliss with the added benefit of great air conditioning, which is essential. Many of the villas have private access to the beach and open air secluded baths or showers to really feel at one with nature. Although beach fronted the hotel has a refreshing pool, bar area and restaurant serving great food and dreamy cocktails to experience the best of both worlds. The hotel staff are a delight, nothing is too much trouble from organising boat trips, island tours, fishing trips or even just a simple taxi. It is impossible not to feel like a VIP at Sensi Paradise.